USG Takistan 2.0 is a heavily modded Arma 3 Server. This requires you to download the required mods. Once ingame you will need to be in Teamspeak to be able to communicate with the people on the server, we do this through Task Force Radio which is a teamspeak plugin that replaces the default arma VOIP. Download Teamspeak if you havent already HERE. 1. Download the teamspeak plugin excecutable HERE. 2. Unzip the zip file and execute the team speak plugin file (Teamspeak has to be closed while doing this). 3. Once succesfully installed, open teamspeak and navigate to > Tools > Options > Addons. 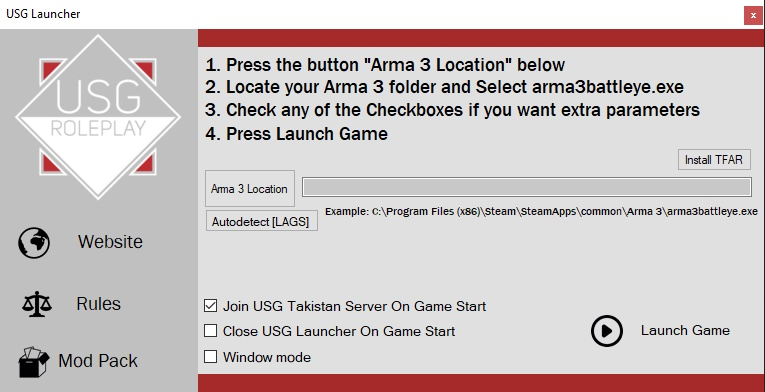 Once your Takistan Mods have downloaded launch the Arma 3 Launcher and follow the steps below. 4. Click on import and select the HTML we gave you! 5. Click the big orange play button down the bottom left. 7. Finally make sure that you are in our teamspeak, you should automatically get moved into the Task Force Radio channel when you load in game. Enjoy! Place it anywhere on your PC and run it. First time you run it your AntiVirus and Windows Defender might want to check if its safe. An VirusTotal scan be find HERE. When you launch the program you will see this screen. First thing you will need to do is press on modpack and that will take you to our Steam Collection. Subscribe to our workshop collection and will automatically download all the mods. If you have problems or questions don't be afraid to come to the channel "Requesting Staff" and we will happily help you out! Press Y and go to "Takipedia" when ingame to open our ingame wikipedia. *Don't download the USG Launcher or any other contet mentioned on this site from any other place then here.